Prof. Hacker was honored to participate in the Cinema Documentary Film "In the Beginning there was Light", directed by P.A. STRAUBINGER (ORF); Allegro-Film & Thim Film Vienna, Austria. World Premiere: September 9th, 2010, Vienna. From 9.17.2010 in Austrian and Swiss cinemas, 10/2010 (Germany), 10-11/2010 (France). Producer: Helmut Grasser ("We Feed the World", "Let's Make Money"...), Line Producer: Katharina Bogensberger. Pre-Showings for press already took place at the film festivals of Cannes, the Berlinale, and the International Film Festival of Munich. 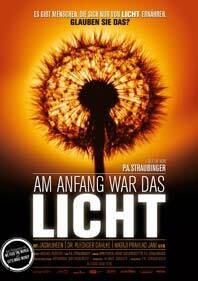 In March 2013, the film was shown on Austrian TV for the first time and was seen by 473.000 viewers. for Radio Voice America Health and the renowned talk show Mind, Brain and Body with the Doctor. Topic: "Building your house above underground water". 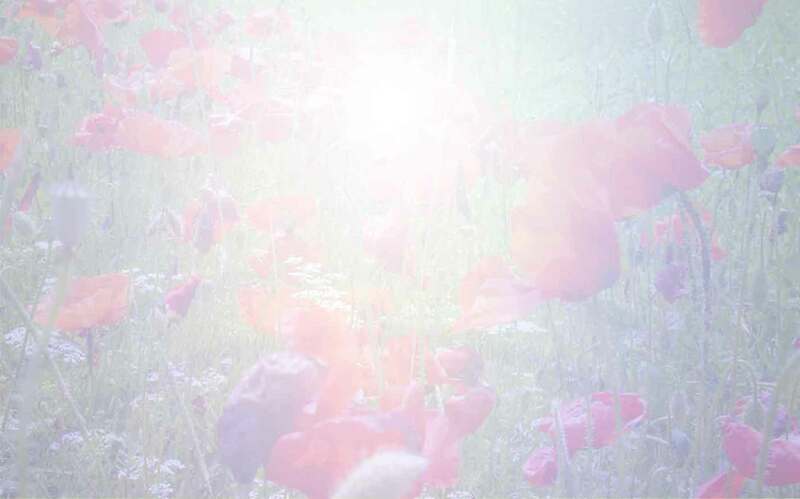 you may download an mp3-file of the program from our website (size: about 26 MB). In the following, a few examples of media reports (in German language) about the work of Univ.-Prof. Dr. Gerhard W. Hacker are offered for download, with kind permisson of the copyright owners. First button line: 1) Portrait on Univ.-Prof. Dr. Gerhard W. Hacker in Salzburg-Krone, 2007. Text: Chief on Duty, Mr. Harald Brodnig. "Krone" is Austria's most-sold daily newspaper. 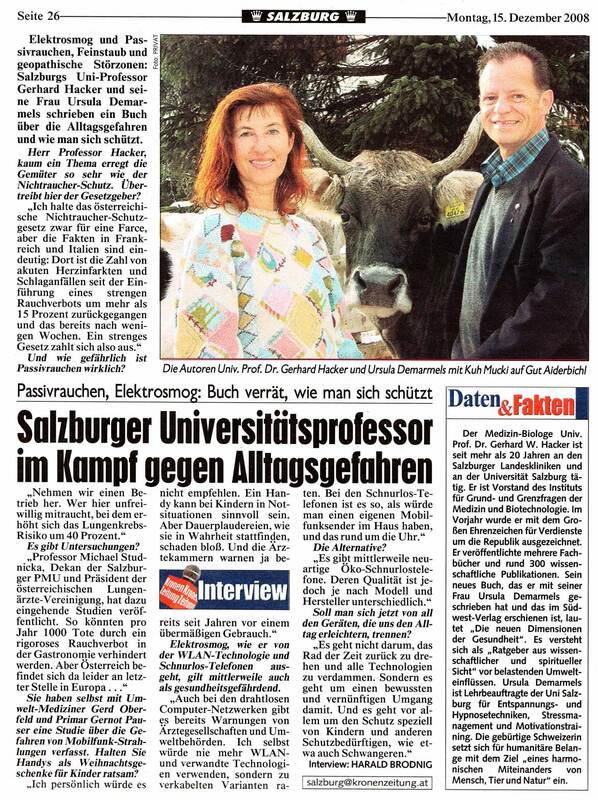 2) Article by Mrs. Martha Blum in AgriNews, Illinois, U.S.A.: Interview with Univ.-Prof. Dr. Gerhard W. Hacker on Milk Cow Studies and the GeoWave device, performed in joint collaboration at the Veterinary Medical University of Zurich, Switzerland by Dr. Linda Furter, 2009. 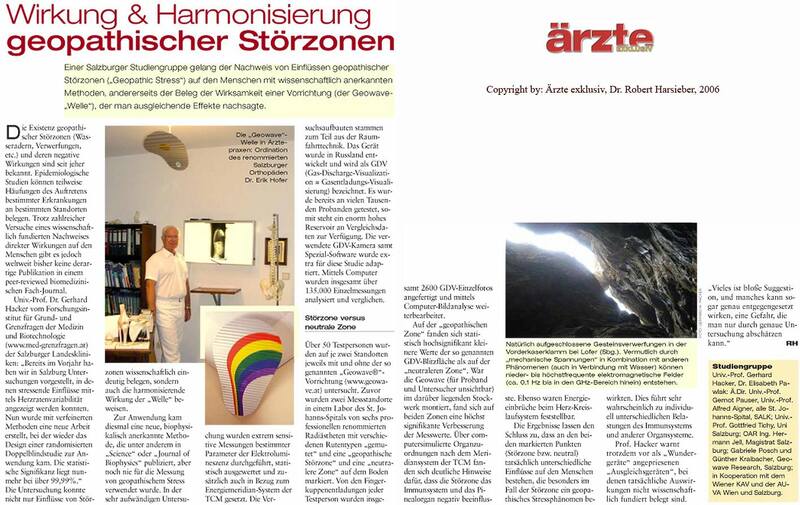 3) Article on "Geopathic stress zones" by Dr. Robert Harsieber, Chief Redakter, Aerzte-Exklusiv Vienna. 4) Interview with Univ.-Prof. Dr. Gerhard W. Hacker by Dieter Wiergowski for the journal "Die andere Realitaet", 2009. 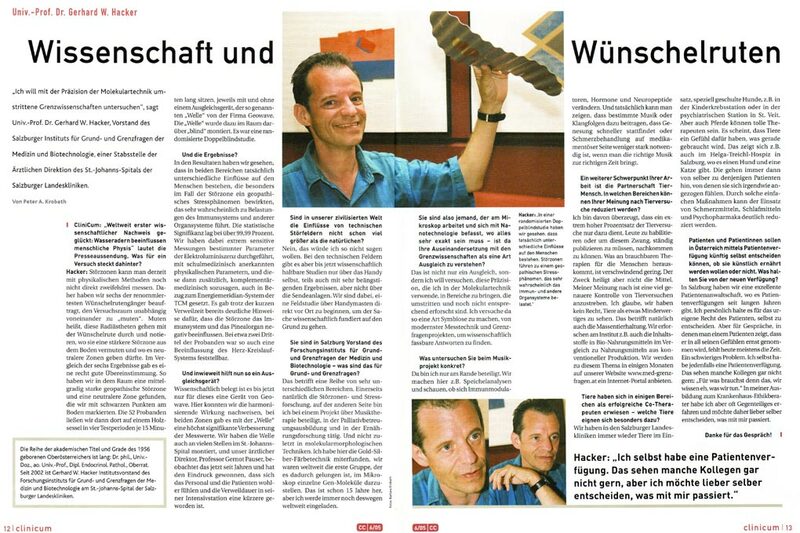 5) 1) Interview with Univ.-Prof. Dr. Gerhard W. Hacker, Salzburg-Krone, 2008, by Harald Brodnig, Chief Redacter. 6) Interview by Peter Krobath for the clinical management journal "CliniCum", 2005. Second button line:1)-3): Article "Water veins: How a design-product helps: the perfect wave", published in "Medizin populaer" (Medicine popular) Vienn, 2005, by Mag. Wolfgang Bauer (3 pages for download). 4) Interview in "Salzburg24" on our GSM base station study, 2008. 5) Medical Tribune 38, 2002: Dr. Robert Harsieber: a portrait on Dr. Gerhard W. Hacker entitled "Proteins, Genes and Healing". 6) Article "Living better based on scientific data and spiritual impulses: Univ.-Prof. Dr. Gerhard W. Hacker & Ursula Demarmels: "The New Dimension of Health", by Kristin Pelzl-Scheruga, Chief Redacter, published in Madonna - Austria's biggest weekly womens magazine, 2008. 7) Article on "Water veins" in the Germany's large women's magazine "Frau im Trend".